If you’re like me, when Suzanne Somers first entered the field of health and healing, you thought, “What does Chrissy Snow know about anything – she read the obituaries and thought everybody died in alphabetical order? !” Although it’s not me at my best, I have to admit, when the beautiful and ageless actress first began speaking out about health issues, I didn’t immediately pay attention. It’s only half my fault, though. I was an AVID Three’s Company fan (during the time Chrissy was on the show, that is – when she left, I left). John Ritter, Joyce DeWitt, and Suzanne Somers WERE Jack, Janet, and Chrissy. Audra Lindley and Norman Fell? Well, they were, of course, the Ropers. I had the episodes memorized and knew each time Jack was about to trip or Chrissy was about to be completely and adorably clueless. In a beautiful and fortuitous twist of irony, Chrissy’s portrayer, Suzanne Somers, is exceptionally bright and highly intelligent. What’s more, she’s possibly an even better author than she is an actress. I understand what you may be thinking, “Yes, she’s beautiful, talented, intelligent, and unforgivably ageless – but I don’t need medical advice from her…” Before you take that stance, let me point out that she isn’t trying to be anyone’s doctor – she’s using her fame, research, personal experience, and writing talent to relay information from nutritionists, doctors, and an entire team of medical experts. If each of these experts were to compile their knowledge, experience, and research into books, it would take us years to read them all. 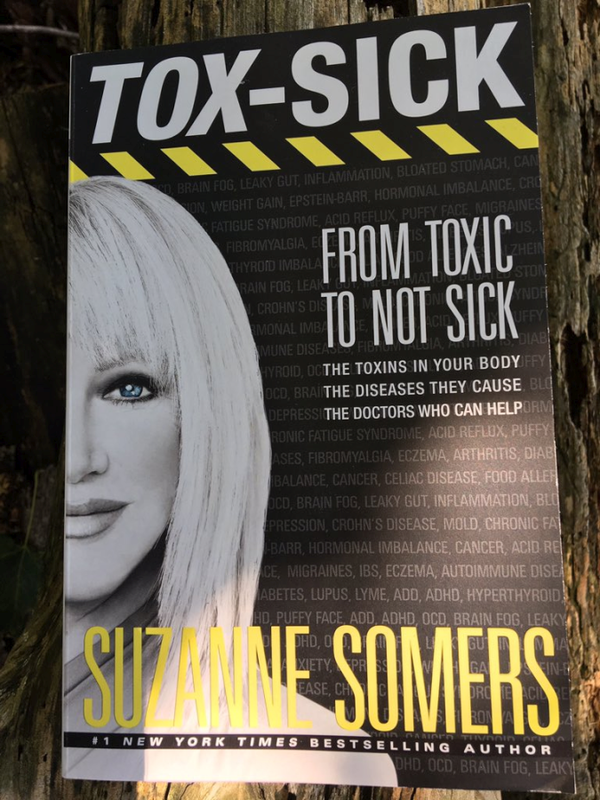 In her wonderful, informative, and best-selling, thank you very much, books, Suzanne Somers does all of the research for us and puts it all in one place. What’s more, let’s face it, she’s much easier to “read” than a panel of physicians might be. Here newest book, Tox-Sick: From Toxic to Not Sick isn’t just a must-read, it’s an absolutely must read. DR. SHERRY ROGERS, an environmental doctor for over 40 years, shares the truth about detoxification—and where you will likely be if you don’t take it seriously. DR. NICHOLAS GONZALEZ shares where cancer comes from and how to manage it by detoxifying the liver and supplementing with enzymes. DR. RITCHIE SHOEMAKER alerts you to mold toxicity, the newest threat to your brain and wellbeing…and just what to do to fight for your health. DR. WALTER CRINNION teaches what everyday objects to avoid and the simple diet and lifestyle shifts to clean up your health and home in mere weeks! DR. STEPHEN SINATRA, America’s leading integrative cardiologist, explains that we have been approaching heart disease all wrong: a healthy gut, detoxed body, and quality fats are each crucial and cardioprotective. DR. GARRY GORDON shares new protocols for removing toxic lead from the body, as well as ways to keep the most important gland in your body, the thyroid, clean and healthy. From diet and supplement advice to coconut oil cleanses, everything you need to live clean and enjoy great health is in your hands. Tox-Sick is as fascinating as it is eye-opening and it’s not an overstatement to say that it has the potential to improve health and save lives. When doing book reviews – especially for books that I want VERY much for you to read for yourself, I’m always extra careful about giving away too much information. Information “sticks” better and has a more lasting effect when the reader “discovers” it on his/her own. Besides, Suzanne Somers didn’t work this hard on a book just to have an overly-caffeinated animal lover in Kentucky give everything away on her blog! However, I do want to give you a few highlights from the book. These are, of course, just tips of a life-changing iceberg. How Probiotics and Digestive Enzymes Can Help Your Body Heal and Rid Itself of Toxins Naturally. How Damage from Toxins Can Actually Mimic Other Diseases. The Alarming Danger of Cell Phones and What You Can Do About It. Clear Ways to Identify if You Have Toxins in Your Body. Why Processed Foods are Something You Should Swear Off. Everything You Need to Know About GMOs. The Effect of Toxins on Your Brain. The Effect of Toxins on Your Heart. The Effect of Toxins on Your Thyroid and Hormones. Dangers of the Wrong Household Cleaners. Coming Clean – The Basics of Detox. Includes a great 9-Point Detox Checklist. How to Go from Tox-Sick to NOT SICK. 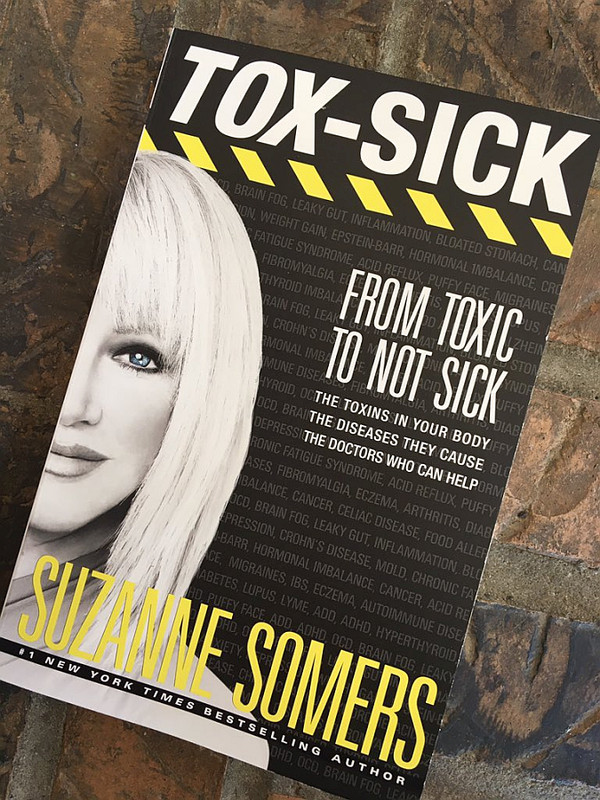 The book includes a wealth of information, research findings, personal experiences (some are from Suzanne Somers’ own family), and interviews with leading physicians and other experts in the field of medicine and healing. After reading TOX-SICK, I’m never going to look at the food or cleaners I buy ever the same again. And I think that’s the whole idea. I hope you’ll grab a copy of TOX-SICK today – either on Amazon or at your favorite bookstore.